May is Pediatric Stroke Awareness Month and the CHASA leaders would like to share some of our favorite organizations with you. These are folks who are doing some awesome work to help kids with hemiplegia, pediatric stroke, or different disabilities in general. The Traveling Awareness Bears, Inc. When Elijah Rutherford was first diagnosed as having survived a stroke in utero, he was 20 months old. It was 2005 and his mother, Jennifer, was at a loss of who to turn to. After searching on the internet, she came across the Children’s Hemiplegia and Stroke Association (CHASA) and quickly signed up for their email support list. Through CHASA, Jennifer met three women who and they all bonded quickly with each other. The four of them leaned on each other through all their hard times and cheered each other on through all the good. Those three women kept Jennifer strong through the early years of Elijah’s journey. When Elijah turned 4, he began asking questions about what was wrong with him. Jennifer tried so hard to explain what a stroke was to him, but at the age of 4, it was difficult for him to understand. He couldn’t see why they couldn’t just put a band aid on his booboo and make it go away. Jennifer began pointing out awareness ribbons to him and telling him how purple was his color. He started pointing them out to his mother everywhere they went. Soon he was asking why they were always pink and yellow. He never once saw a purple ribbon. At age 5 he started telling everyone he met, no matter where they were, “Did you know kids and babies have strokes? I had a stroke in utero, did you know you could have a st roke in utero?”. This was always followed by what Jennifer began referring to as ‘the look’. Eyes bulging, mouth dropped open, disbelief written all over their faces. Elijah became quite the educator. It bothered him more and more about the lack of purple ribbons. His favorite shirts to wear were always pediatric stroke awareness shirts. Pediatric Stroke Awareness Day became his favorite day of the year. It was the same excitement as waking up on his birthday. He began telling people they NEED to wear purple to support pediatric stroke. He convinced a local baker that he and his parents frequented after his therapy sessions, that he had to bake purple awareness ribbon cookies when he spotted pink ones in the window. The following week, the baker had 6 purple cookies waiting for Elijah. At the age of 7, he decided the world needed to know there was more awareness to raise than just cancer. He decided to send his teddy bear around the world to visit kids just like him, so they could see that there were other kids, just like them. His bear was named Pat Bearowitz, he was dressed in an “I survived a stroke” T-Shirt, complete with a purple ribbon. Elijah’s orthotist loved the idea so much, he donated a DAFO (foot orthotic) for Pat. Pat was given a story based on Elijah’s and his mother posted it on her Pediatric Stroke Awareness Facebook page. Within days, he had 30 requests for a visit from Pat. He began traveling in November of 2010 and to date had received over 100 requests. His sister Patricia has over 30 Internationally. Since Pat and Patricia, we have added Patrick and Patrice to help them out. 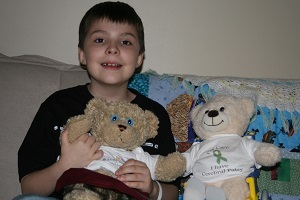 The Traveling Awareness Bears now has over 50 medical conditions with over 150 teddy bears traveling the world. The bears have medical equipment unique to their specific needs and travel with journals and passports so kids can read all about their previous adventures, and see that they are not alone with their challenges. To request a visit, head over to www.travelingawarenessbears.org because there is nothing like feeling that there is someone just like you! 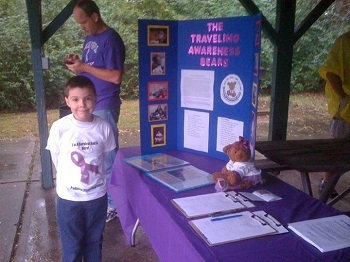 CHASA salutes Elijah, his mom Jennifer, and the Traveling Awareness Bears board and volunteers for their awesome and dedicated efforts to raising Pediatric Stroke Awareness around the world.